You Go, Turbo! Yugo Turboooooooo! It had to happen. Mix together a junkyard stew of Yugos, Fiats, turbocharging bits and pieces, and a big helping of ingenuity, and you get: TURBO YUGO! 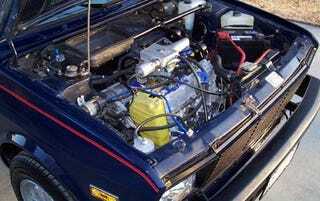 This gentleman took an '87 Yugo GV, dropped in an X-1/9 powerplant, then rigged up a blow-through turbocharging setup with gear torn from a '91 Saab. It's a bit disappointing that he considered a Megasquirt fuel-delivery system but stuck with the stock carb instead, but no matter. Just being able to say you roll in a Yugo Turbo is enough. Fried-Out From the Factory: Yugoamino!